Geekbench Listing For Google Pixel 4 "Sargo" Leave Fans Confused: Could It Be The Pixel 3 Lite Instead? Google Pixel 4 is one of the highly anticipated smartphones coming this year. In fact, many tech enthusiasts are constantly on the lookout for new leaks, rumors and official talks about it. So what new detail do we have this time around? Well, a Geekbench listing for the Pixel 4 has been spotted. However, what’s really interesting about it is that it only has 2GB of RAM. According to reports, a listing for a Google Pixel 4 has turned up on Geekbench. On the listing, it appears that the device features 2GB of RAM and runs on Android 10 (aka Android Q). Moreover, it carries the codename “Sargo”. As we mentioned, the Pixel 4 “Sargo” features 2GB of RAM which is strange because if we look at the currently available Pixel 3 phones, they come with 4GB of RAM. It would be strange for Google to let its 2019 flagship phone come with less powerful specs compared to its predecessor. So does this mean that it’s a mid-range variant? Like maybe this could possibly be the Pixel 3 Lite instead? Perhaps so. However, there’s one thing you should know about “Sargo”. According to a report, the codename “Sargo” has already been linked with the expected Pixel 3 Lite device which is reportedly going to be released in the first half of 2019 and could cost probably between $400 and $500. But looking at this Geekbench listing, it does make things confusing. Is “Sargo” the Pixel 3 Lite or the Pixel 3 Lite? But What If The Listing Is Incorrect? The possibility has indeed been addressed by news outlets. 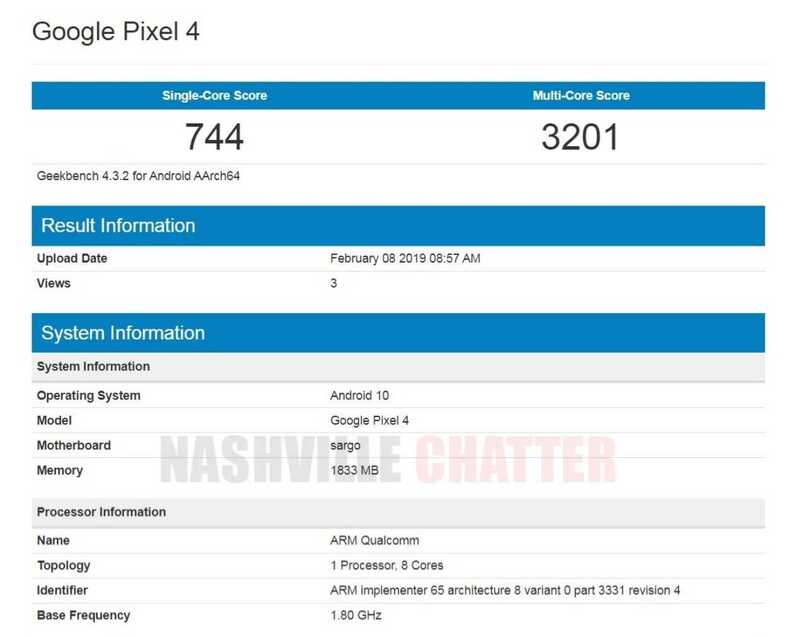 They noted that NashvilleChatterClass, who spotted the Geekbench listing for the Google Pixel 4, has speculated that this current post could be an error. But what do you guys think? Is it the Pixel 4? Tell us in the comment section below.